Apply for Accreditation online now! Auto renewal - takes first payment of £40GBP then takes payment every year thereby renewing your accreditation automatically (can be cancelled at any time through PayPal). If you are a club/organisation wishing to make a bulk payment / payment on behalf of an individual please email N.Parmar@mdx.ac.uk. Your application will normally be processed within 4-6 weeks. See the re-accreditation workflow for further details. Accreditation is for those with relevant experience of performance analysis support with sports teams and individuals. Please consider the following criteria before selecting the level you wish to apply at and provide information to assist the accreditation panel who will review each application and provide email confirmation of level awarded within 4-6 weeks after receipt of accreditation fees. 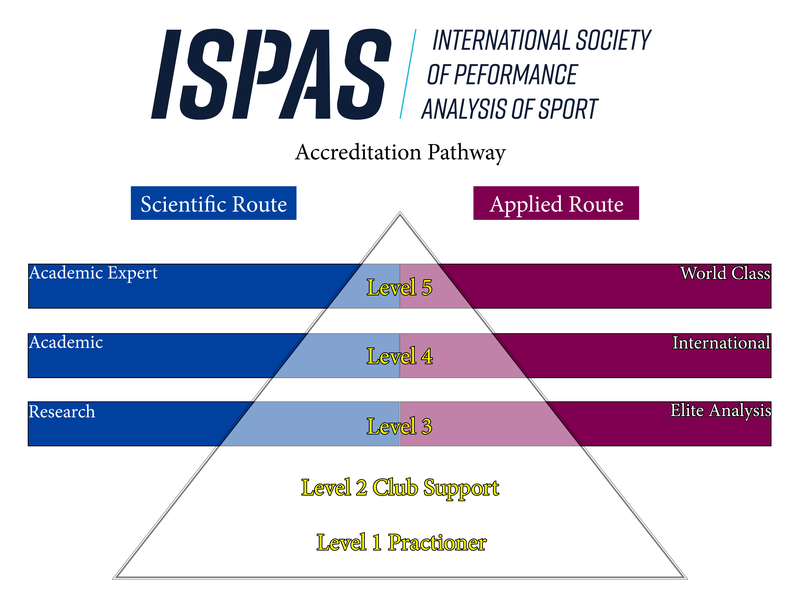 Individuals who meet the minimum standards for level 1 or 2 accreditation will receive the generic ISPAS accreditation, after these levels there are two pathways, the applied and the scientific routes. Individuals should refer to Table 1 for required competencies and decide which route and level they wish to apply for. Please note that all criteria at any lower levels must be satisfied for accreditation at higher levels. To download the guide notes, click here. Routledge are offering all of our accredited members a discount on their titles. Accredited members will receive their unique discount code by email, thereafter they can enter the code at checkout on the Routledge website, www.routledge.com, and a 20% discount will be applied! Performance Innovation are offering all of our accredited members a significant discount on their Focus Performance Analysis Software. All ISPAS Accredited Members will be get a 12-month license of the Focus X2 software at the heavily reduced cost of £60 (Reduced from £950). Accredited members will also receive discounted registration fees for ISPAS Workshops and Conferences. After carefuly consideration ISPAS accreditations will change from a 2 year period to 1 year period for all applications processed from 01 September 2018 onwards. This allows for our accredited members recent experiences and competencies to be taken into account and applicants can apply for a higher level if they meet all competencies shown in the accreditation guide for a particular level, at the end of their accreditation. All accreditations issued up until 31 August 2018 will remain valid for two years.